There are so many ways to tell her you love her… Flowers – A special date night – A love letter. But nothing tells her you love her better than diamonds from Skatell’s Custom Jewelers of Greenville, South Carolina. Fifty three years ago Greenville, South Carolina was changed with the opening of Skatell’s Jewelers, because at Skatell’s they delight in serving their community through service and their customers through exceptional experience. That exceptional experience begins with their passion for finding the perfect gift to “Skatell Her You Love Her.” Coast Diamond is thrilled to honor Skatell’s Custom Jewelers of Greenville, SC as a Retailer of the Week for a third time. Skatell Her You Love Her with one of these stunning Coast Diamond rings. Skatell her you love her with this ultimate statement of warmth and romance, the Coast Diamond wedding set (LC5438RG_WC5438RG) in white and rose gold. The center stone is circled by the diamond encrusted double halo, all set in white gold to enhance the sparkle of the diamonds. Strings of diamonds, set in rose gold, fall away from the center and twist around the sides of the finger. Its perfect companion wedding band is contoured to fit snuggly against the engagement ring. Skatell her you love her with two carats of love that are the centerpiece of this Coast Diamond engagement ring (WC10035). Three strands of diamonds lead the eye to the gorgeous 2CT center stone, held by double prongs. Skatell her you love her for an anniversary, with this lovely Coast Diamond band (WC20013) of brilliant round diamonds set in microprongs. It is just one of several bands in the Coast Diamond Brilliance Collection which features round brilliant diamonds set in microprongs. Congratulations to Skatell’s Custom Jewelers for being our Coast Diamond Retailer of the Week! Let us begin by explaining why being a jewelry snob is such a good thing. The jewelry snobs at Tracy Jewelers in Spokane, WA love all things jewelry. From sales to custom design, marketing to appraisals, everyone at Tracy’s is excited to go to work each day so they can share their love of jewelry with you. It is for the love of all things jewelry that Coast Diamond is thrilled to call Tracy Jewelers of Spokane, WA our Retailer of the Week. The love of all things jewelry began with Tracy Jewelers’ first generation, Patrick Tracy and continues today with his grandson, Sean Tracy. Tracy Jewelers’ integrity and love for jewelry design grew from a foundation begun in 1950 by watchmaker, Patrick Tracy. Three (soon to be four) generations of the Tracy family later, they are proud to call themselves jewelry snobs… bringing the region fresh and stunning Coast Diamond jewelry designs. Diamond bands are the freshest trends in jewelry and jewelry snobs love them. These Coast Diamond rings (WC10189H) come in your choice of white, yellow or rose gold. This stunning Coast Diamond cushion shaped halo engagement ring (LC5256) completes every bride’s #ringgoals. The Coast Diamond fishtail set diamond wedding band (WC5183H) is a gorgeous addition on your wedding day. The Hope Diamond is the most famous cushion cut diamond. A cushion cut halo shaped ring is often set with a round center stone. Thank you to the jewelry snobs at Tracy Jewelers for sharing your love of jewelry with all of us. Congratulations for being our Coast Diamond Retailer of the Week! We hope your day is sweet and filled with love! What better place to find the top three engagement ring trends for your Valentine than Green Brothers Jewelers of Bay City, Texas? Cutting edge design and unparalleled customer service are the pride of Green Bros. Jewelers. Beauty and hospitality are the hallmarks of the South. So it is no wonder Coast Diamond found the warmth and romance of these three engagement ring trends for 2017 at Retailer of the Week, Green Brothers Jewelers in Bay City, TX. #1 Rose Gold is everywhere from the iPhone to Beats headphones, and bridesmaids dresses to engagement rings. While rose gold is super trendy, it adds warmth to diamonds that no other metal can. A rose gold Coast Diamond one carat solitaire engagement ring (LC5446) is tradition with a twist. The center stone is set in white gold, with a peek-a-boo diamond underneath and surrounded by two rows of micro diamonds on the shoulders and two more rows on the matching wedding band (LC5446). #2 Mixed Metals allows you to create something unique and one-of-a-kind. Stacking rings with diamond bands of mixed metals is over the top… When you add an engagement ring of mixed metals. Coast Diamond floral inspired halo engagement ring (LC6026RG) framed with rose gold milgrain edging and features a split band of fish tail set diamonds . This Coast Diamond one carat floral inspired halo engagement ring (LC6026) framed with milgrain edging becomes a standout with a frame of rose gold. Even better… a split band of fishtail set diamonds holds this stunner comfortably on your finger. #3 Oval Cut engagement rings, while a huge trend, are timeless. Princess Diana’s oval cut sapphire, now worn by Princess Kate, proves the timelessness of the oval cut. Blake Lively’s oval cut engagement ring set in rose gold pushes this trend to the limits of gorgeous. The timeless Coast Diamond one carat oval halo engagement ring (LC10233) features delicately set diamonds around the halo and on the band. Did you know… an oval shaped engagement ring makes your finger look slimmer? Stop into Green Brothers Jewelers today and choose one or all three of these engagement ring trends of 2017 for your Valentine. Congratulations to Green Brothers Jewelers in Bay City, TX for being our Coast Diamond Retailer of the week and showing how the trends of 2017 are done! For over a century Barmakian Jewelers of New England has become admired for their philanthropy throughout the region. But they are known for providing the best selection, value and service to their customers in the fine jewelry business. Their continued efforts of love and service to their community have earned Barmakian Jewelers of New England our Coast Diamond Retailer of the Week for the third time. Engagement season is heading toward one of the most popular days for proposals, Valentine’s Day. Hopeful brides-to-be of New England are in great anticipation that Valentine’s Day will be the day. If you are one of these brides-to-be or a future groom we know you will find the ideal Coast Diamond engagement ring at Barmakian Jewelers. The moment you surprise her on Valentine’s Day with this classic Coast Diamond six prong solitaire engagement ring, LC5250, you will take her breath away. The matching diamond wedding band, WC5250, makes this the gift for a lifetime of love. She will be over the moon when you propose with this Coast Diamond 2 carat cushion shaped halo engagement ring (LC10056). This ring is special because it is finished with beautiful scallops that frame the halo and shoulders of the ring. Make her dreams come true this Valentine’s Day when you propose with this perfect Coast Diamond 1 carat halo engagement ring, LC10129. Complete the look with the matching diamond band, WC10129. Both rings are encrusted with fine fishtail set diamonds. At Barmakian Jewelers of New England you can customize your ring with the gorgeous center stone of your choice. As an authorized retailer, Barmakian Jewelers has the ability to request your Coast Diamond engagement ring be set in the metal of your choice: white, yellow, or rose gold, or platinum. Coast Diamond congratulates Barmakian Jewelers for their continued success in the fine jewelry business. 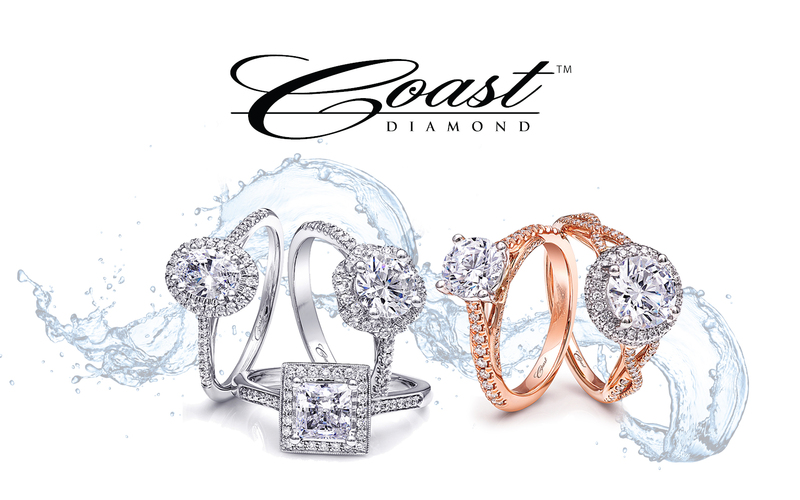 We are thrilled to call you our Coast Diamond Retailer of the Week!